Old school punk rock. Cynical lyrics. 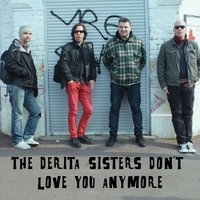 Formed in 1992, The DeRita Sisters became cult favorites in Germany for some reason, nobody knows why. 21 years, 7 tours, 26 records and just as many members, the DeRita Sisters played to a full house at The Rebellion Festival in 2012 and embarked on a ten date tour in Germany and France in early 2013 and finally got the recognition they so rightly deserved. This is a recording of the third show of the 2013 tour in Riesa, Germany. The set contains all the classics and more.